With the cold, snow and ice of winter looming, you’ll soon be buttoning up your home for the frosty months ahead. Closing up all of your windows and doors, or even using thermal curtains or plastic wrap to help seal small drafts, can help immensely, but if you have small gaps in your roof, you could still be losing heat through the of energy, not to mention opening your home to potential leaks or moisture problems. Roof RepairThis fall is a perfect time to make sure that your roof is ready for the harsh weather ahead. Professionals go through a five-step process for performing a thorough roof repair and cleaning for winter preparation, ensuring that every section of your home is well covered and protected from the elements. 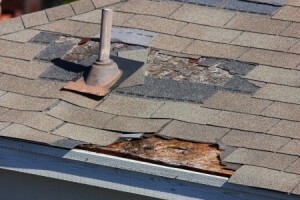 First, any missing shingles or flashing that may have been damaged, destroyed or broken away are replaced. Heavy rains, ice and high winds can wear your roof, and replacing any missing shingles helps keep even protection across the entire roof surface. Next, technicians look for loose shingles or flashing that may be susceptible to breaking or blowing away, securing them in place. Roofing experts then reseal all seams around roof vents and chimneys, making sure that these gaps are closed, airtight and watertight. They then do the same around pipe flanges, helping to keep warmth in and moisture and cold out. Lastly, all gutters are checked and reattached, if necessary, as well as cleaned of any loose debris like sticks, twigs and leaves that can lead to ice dams and drainage problems. Once the roof has been completely checked, repaired and secured, technicians can perform a low-pressure wash of the entire roof surface, helping to remove dirt and accumulated materials that can cause wear overtime. The wash also helps to remove mold and fungus spores, preventing these pests from growing or regrowing. Overtime, rooftop growth can lead to wood rot, so keeping spores at bay is a vital part of maintaining a healthy roof. The professionals at Jun’s Mold Remediation are experts at cleaning and repairing roofs and are now taking appointments for pre-winter maintenance and preparation needs. Don’t delay and end up worrying about roofing problems in January – get your roof checked, repaired and cleaned before the flakes fly. For more information – including a free estimate – contact us today! Does Your Attic Need Additional Ventilation? How Can Mold Affect Your Home’s Resale Value? Venting About Vents: Now’s the Time to Check!